The Community-based Institutes on Peace Education (CIPE) movement is a localized partner initiative of the IIPE that was established in 2006 as a way of sustaining the impacts of the short-term IIPE community within local contexts. CIPEs are sustainable, community-based, non-formal peace education teacher training initiatives designed to address the lack of formal opportunities for the preparation of educators in the methods and practices of peace education and for active citizen engagement. CIPEs are locally developed and taught in local languages to more adequately address local manifestations of violence, local and national educational policies, and prepare educators in culturally and contextually relevant educational practices. The IIPE secretariat helps coordinate the global CIPE movement. Several experimental CIPE communities have been established, including Colombia (nationally), India, Japan, Peru, the Philippines (Mindanao), Tanzania and the Ukraine. to help expand the potential for research and new developments in the field of peace education. A CIPE promotes a peace education philosophy, content and processes that are holistic, inquiry-based, participatory, dialogical, reflective, as well as transformative and directed towards positive social change or action. A CIPE upholds the model of a nonhierarchical and open learning community in which participants learn with and from each other, because of the understanding that social change is best pursued and sustained cooperatively and in community. Hence, it includes programmatic elements that foster this model: mutual sharing of ideas, experiences, practices and questions in plenary sessions and interactive workshops as well as sharing significant learnings with a reflection group. A CIPE learning community seeks to be linked with other CIPE learning communities toward the establishment of a more systematic, deliberate and vibrant peace education movement worldwide. Through the sustained engagement of these learning communities, and in solidarity with kindred groups, the creation of a more peaceful and just world is made more possible. 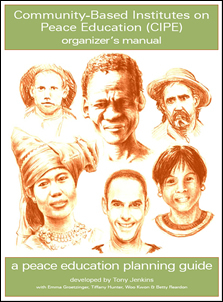 This “Organizer’s Manual” is designed to assist formal, non-formal and grass-roots educators and educational planners by providing ideas and tools for the development of community-based peace education learning projects that might contribute to the reduction of violence at all levels of the global social order. More specifically, it has been developed to aid in the planning of “Community-Based Institutes on Peace Education (CIPE),” a special community-centered initiative of the International Institute on Peace Education (IIPE). This manual does not offer a “one-size-fits-all” approach to peace education. As you explore the contents you will see that this manual is arranged like a workbook. It is organized around inquiries into practical considerations for designing peace education initiatives in multiple and varying contexts. These inquiries are designed to engage you – the educator/planner – in reflections upon your own unique situation and possibilities for affecting change through education. We believe that the process of planning a peace education course, workshop, program, conference, or community-based learning project is a task best approached in a “learning mode.” In our experience, we often find that we learn as much in the process of planning as we do in conducting the actual initiative. Educational planning done in a “learning mode” is a process that requires comprehensive and holistic thinking and approaches for dealing with complex and often systemic problems that can often feel overwhelming. Goals such as the transformation of the “war system” and nurturing and sustaining a culture of peace are integral considerations to most peace education practice and content, yet such goals can be challenging to translate into present and local contexts where peace education initiatives are actually taking place. The inquiry in this manual is designed to help educators simultaneously consider the socially transformative “big picture” goals of peace education while addressing local concerns, realities and practical possibilities for affecting change. Peace education is often described as education for social transformation. Social transformation is a process, we believe, best pursued and sustained cooperatively and communally. Community-based learning, or learning in community, is strengthened and made more effective when diversity and difference are encouraged and embraced. It is a process that encourages the participation of diverse constituents to work toward commonly identified goals and objectives. It can also facilitate the development of community where no apparent community existed before. The educational approaches and ideas described in this manual embrace community as a central organizing principle for facilitating social change and transformation. The manual also reflects values and approaches rooted in positive notions of community, such as cooperative learning, empathy, and mutual understanding. Coming to understand what makes a community and how a community can work, learn and grow together to affect change is the central learning objective of this manual. To order hard copies of the Manual please send an email to info@i-i-p-e.org. CIPE Colombia is coordinated by Fundacion Escuelas de Paz. CIPE Mindanao is coordinated by Ateneo De Zamboanga University. The first “CIPE India” was coordinated by the Centre for Peace Education Manipur, CFPEM. CIPE Peru was coordinated by the NGO EDUCA. CIPE Ukraine was coordinated by the Women’s Information Consultative Center. The first CIPE held in Africa was coordinated by the Dar Es Salaam Institute on Peace Education.